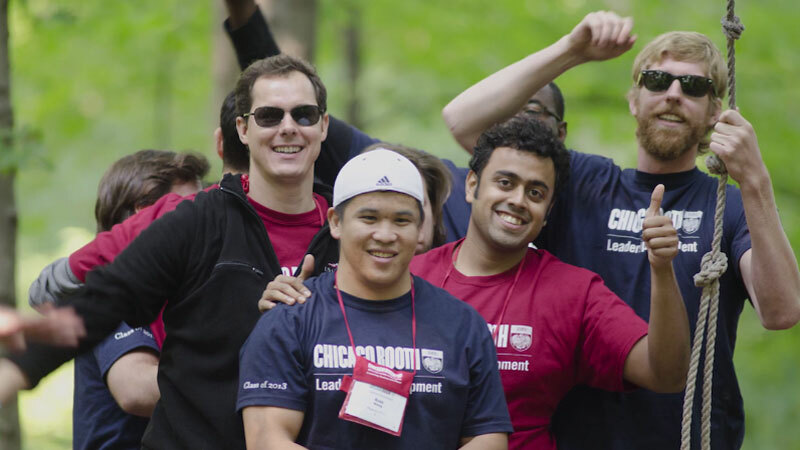 The LEAD program begins with a Leadership Orientation Retreat, a time for team-building activities and forming friendships that last throughout business school and beyond. Booth's experiential leadership development course prepares students for the evolving challenges of leadership in the real world. Camaraderie. Self-improvement. Individualized, hands-on learning experiences. When asked to name their biggest takeaways from Booth's signature Leadership Effectiveness and Development (LEAD) program, students name these and more as highlights of their experience. Designed to enhance self-awareness and interpersonal effectiveness, LEAD gives students the opportunity to benchmark themselves with respect to critical aspects of leadership—working in teams, influencing others, conflict management, interpersonal communication, presentation skills, and more. "It's real. It's not about other people or personalities in books or business leaders out in the world—it's about you," says Tunde Bamigboye, '16. Watch the video below to hear more student testimonials, and see how LEAD helped them to create a personalized plan for continued development at Booth and beyond. For more information on the LEAD Program, contact the Chicago Booth Leadership Development Office.